کنعانی, کبری, گودرزی, محمدعلی. (1396). تأثیر معنادرمانی اسلامی بر بهبود سازگاری اجتماعی و تاب‌آوری مادران کودکان عقب‌مانده ذهنی. 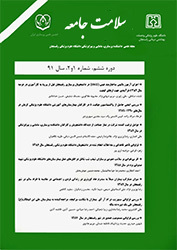 سلامت جامعه, 10(1), 52-62. کبری کنعانی; محمدعلی گودرزی. "تأثیر معنادرمانی اسلامی بر بهبود سازگاری اجتماعی و تاب‌آوری مادران کودکان عقب‌مانده ذهنی". سلامت جامعه, 10, 1, 1396, 52-62. کنعانی, کبری, گودرزی, محمدعلی. (1396). 'تأثیر معنادرمانی اسلامی بر بهبود سازگاری اجتماعی و تاب‌آوری مادران کودکان عقب‌مانده ذهنی', سلامت جامعه, 10(1), pp. 52-62. کنعانی, کبری, گودرزی, محمدعلی. تأثیر معنادرمانی اسلامی بر بهبود سازگاری اجتماعی و تاب‌آوری مادران کودکان عقب‌مانده ذهنی. سلامت جامعه, 1396; 10(1): 52-62. 1دانشجوی دکتری بالینی، دانشگاه شیراز، شیراز، ایران. 2استاد، گروه روانشناسی بالینی، دانشگاه شیراز، شیراز، ایران. مقدمه: عقب‌ماندگی ذهنی معضلی است که بنیان خانواده را تحت تأثیر قرار می‌دهد. با تولد یک فرزند عقب‌مانده ذهنی عملکرد روان‌شناختی والدین دچار اختلال می‌گردد. دو مؤلفه روان‌شناختی مورد توجه در این فرایند، سازگاری اجتماعی و تاب‌آوری روان‌شناختی والدین است. لذا پژوهش حاضر با هدف بررسی تأثیر معنادرمانی اسلامی بر بهبود سازگاری اجتماعی و تاب‌آوری مادران کودکان عقب‌مانده ذهنی انجام گرفت. مواد و روش‌ها: پژوهش حاضر، مطالعه‌ای نیمه تجربی، از نوع پیش‌آزمون- پس‌آزمون با گروه گواه بود. جامعه آماری پژوهش شامل تمام مادران دارای کودک عقب‌مانده ذهنی در اصفهان بود. جهت انجام این پژوهش 45 مادر دارای فرزند عقب‌مانده ذهنی با روش نمونه‌گیری هدفمند انتخاب شدند.گروه‌های آزمایش در 9 جلسه 90 دقیقه‌ای معنادرمانی اسلامی شرکت کردند. ابزارهای مورد استفاده، پرسشنامه‌های سازگاری اجتماعی و تاب‌آوری بود. داده‌ها با روش تحلیل آنکوا مورد تجزیه و تحلیل قرار گرفتند. یافته‌ها: نتایج بیانگر آن بود که آموزش معنادرمانی اسلامی منجر به تفاوت معنی­دار در میانگین پس‌آزمون نمرات گروه‌های آزمایش در هر دو متغیر سازگاری اجتماعی (001/0p<) و تاب‌آوری (001/0p<) شد. 2Professor of Clinical Psychology, Shiraz university, Dept. of Clinical Psychology, Shiraz, Iran. Introduction: Mental retardation is a problem which affects the family’s foundation. By giving birth to a retarded child the parents’ psychological performance becomes disturbed. Two psychological components attended in this process are social adaption and psychological resiliency. Therefore, the present study was conducted to investigate the effect of Islamic logo therapy on the improvement of social adaptation and resiliency in the mothers of mentally retarded children. Material and methods: the present study was a semi-experimental research with pretest, post-test and control group type. The statistical population of the study included mothers of mentally retarded children in Isfahan. In order to do the study 45 mothers of mentally retarded children were selected through purposive sampling method. The experimental groups took part in 9 ninety-minute sessions of Islamic logo therapy. The applied instruments were the questionnaires of social adaptation and resiliency. The data were analyzed through ANCOVA. Findings: the results indicated that teaching Islamic logo therapy leads to a significant difference in the mean of post-test scores in the experimental group in both variables of social adaptation (p<0/01) and resiliency( p<0/01). Conclusion: Islamic logo therapy causes the mothers of mentally retarded children to significantly improve in the components of social adaptation and psychological resiliency, and it leads to better social adaptation and higher resiliency in the process of personal and social life despite having a retarded child. Demirel M. Primary School Curriculum for Educable Mentally Retarded Children: A Turkish Case. Online Submission 2010;7(3):79-91. Zembat R, Yıldız D. A comparison of acceptance and hopelessness levels of disabled preschool children's mothers. Procedia-Social and Behavioral Sciences 2010;2(2):1457-61. Tuna T, Unalan H. Quality of life of primary caregivers of children with cerebral palsy. Deve Med Child Neurol 2007; 46(9): 647-9. Campbell R. Psychiatric dictionary.9nd ed. Washington: mosby; 2009: 236-40. Biyabangard E. How to promote self - respect in children and adolescents. 2nd ed.Tehran: Anjoman Olia va Morabian; 2008:63-72. [Persian]. Garg P, Rastogi R. Emotional intelligence and stress resiliency: A relationship study. International Journal of Educational Administration 2009;1(1):1-16. Allik H, Larsson J-O, Smedje H. Health-related quality of life in parents of school-age children with Asperger syndrome or high-functioning autism. Health and quality of life outcomes 2006;4(1):1-8. Lee JE, Sudom KA, Zamorski MA. Longitudinal analysis of psychological resilience and mental health in Canadian military personnel returning from overseas deployment. Journal of occupational health psychology 2013;18(3):327-37. Pisula E. Parents of children with Autism: Recent research findings. Psychological functioning of mothers. Clinical Child Psychology 2002; 19(2): 371-9. Ng S, Chan TH, Chan CL, Lee AM, Yau JK, Chan CH, et al. Group debriefing for people with chronic diseases during the SARS pandemic: Strength-Focused and Meaning-Oriented Approach for Resilience and Transformation (SMART). Community mental health journal 2006; 42(1):53-63. Frankel V. People in Search translate by Salehian and Milan. 26 ne ed, Tehran: Dorsapublication; 2011:44-57. [Persian]. Qoran. Qom: Ansar Al Mahdi Publication; 2011: 267, 496[Persian]. Noone SJ, Hastings RP. Building psychological resilience in support staff caring for people with intellectual disabilities pilot evaluation of an acceptance based intervention. Journal Intellect Disability 2009;13(1):43-51. Dhingra R, Manhas S, Thakur N. Establishing connectivity of emotional quotient (EQ), spiritual quotient (SQ) with social adjustment: A study of Kashmiri migrant women. J Hum Ecol 2005;18(4):313-7. Somov PG. Meaning of life group: Group application of logotherapy for substance use treatment. The Journal for Specialists in Group Work 2007;32(4):316-45. Wink P, Ciciolla L, Dillon M, Tracy A. Religiousness, spiritual seeking, and personality: Findings from a longitudinal study. Journal of personality 2007;75(5):1051-70. McConkey R, Truesdale-Kennedy M, Chang M-Y, Jarrah S, Shukri R. The impact on mothers of bringing up a child with intellectual disabilities: A cross-cultural study. International Journal of Nursing Studies 2008;45(1):65-74.